Help with Colorado kitchen remodeling, refurbishing, updating, or renovations. You can achieve Professional Results an an Owner-Builder! Do you have a lot of ideas but need some professional advice to help you pull them together? Do you have more questions than answers? We work with Owner-Builders to help them avoid common and expensive pitfalls throughout all stages of their kitchen remodeling. Considering new cabinets? Want to change counters and backsplash treatments? Need new flooring? For work you don’t want to tackle yourself, we’ll match you with trustworthy and competitively priced trade contractors and local general contractors. 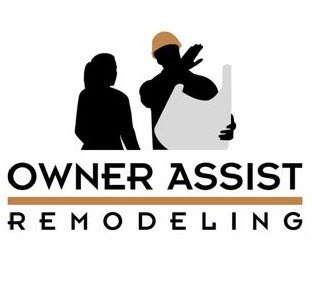 One great way to learn more about our skills is by reading and using our valuable remodeling and renovation tips listed below. Average Cost to Remodel a Kitchen. The cost of a kitchen remodel, similar to bath remodels, can grow and become expensive in a hurry. It’s not any one item that drives up the cost, it’s the sum of all the different parts of the work that will add up fast. Cabinets, appliances, counters and floors make up the bulk of the cost. Select above average quality in those areas and the overall cost of your kitchen multiplies quickly. Kitchen renovation budgets can start as low as $1,000 for just paint and a new sink. A kitchen remodel planner and kitchen remodeling contractor might design and build kitchens costing $120,000 or more for a high end masterpiece. As a beginning point for the budget of your kitchen remodel estimate, use 8-10% of the value of your home and adjust up or down from there. 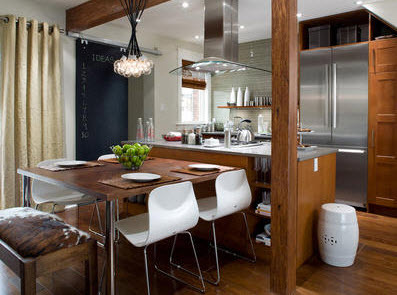 The cost can easily double if you like nicer fixtures and finishes. Installing Tile. It’s nice if you can install your floor tile before the cabinets go in. You’ll avoid a lot of grout joints along the cabinets, and will have a full room of tile in case you ever want to make a change to the layout of your cabinets. Subfloor. Never install floor tile directly on a wood subfloor. Use the correct thickness of underlayment so that tile floors are level with the adjacent flooring. Grout Line Width. Large tiles and thin grout lines are often preferred by designers. A word of caution, both make for a more difficult installation to keep the tiles flat and flush with each other. Cabinets. 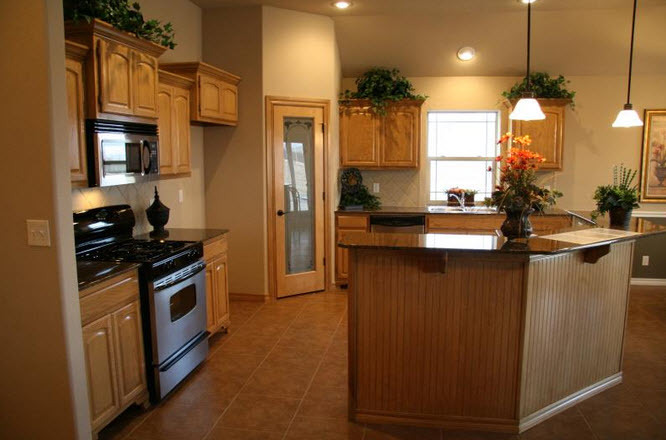 There are two different side panel styles for kitchens. The basic cabinets have smooth panel sides in woodgrain or smooth. A nice upgrade is to use a panel that matches your door style on the cabinet ends. You’ll probably want to do both uppers and base cabinets. Consider upgrading to under cabinet lighting. Under-cabinet lighting is a really nice feature. You’ll need to decide whether you want Xenon, argon, fluorescent or LED. Installing Kitchen Islands. Luckily kitchen islands do not need to match the rest of your cabinets. 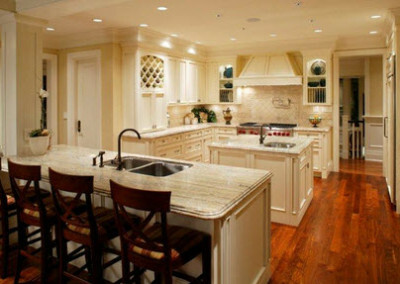 An island is the centerpiece and focal point of your kitchen. Kitchen designers often select a different and complimentary cabinet finish and counter top for a kitchen island. Granite Counter Tops. 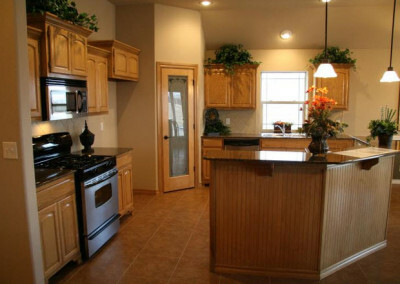 One way to buy new natural stone tops is to go directly to a granite fabricator. They are the people who template, create and install the tops. 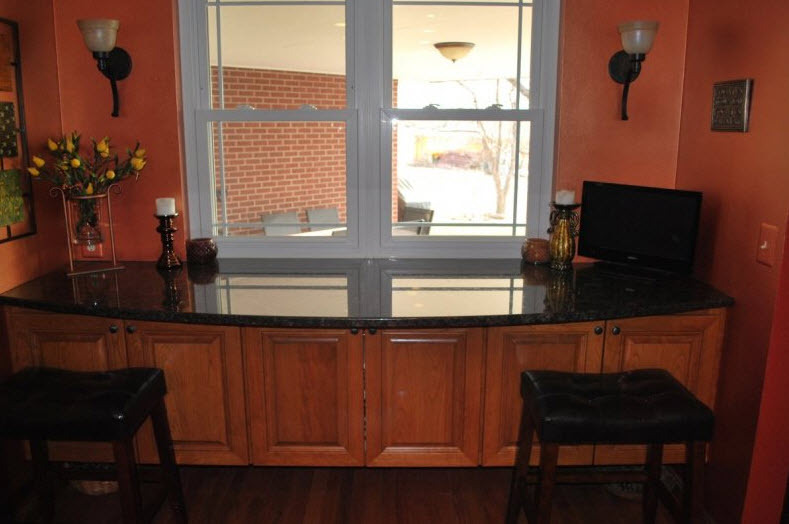 Granite fabricators are who the home builders go to for their tops. The fabricator creates the tops but does not provide the slab. For that you go to a slab wholesaler. 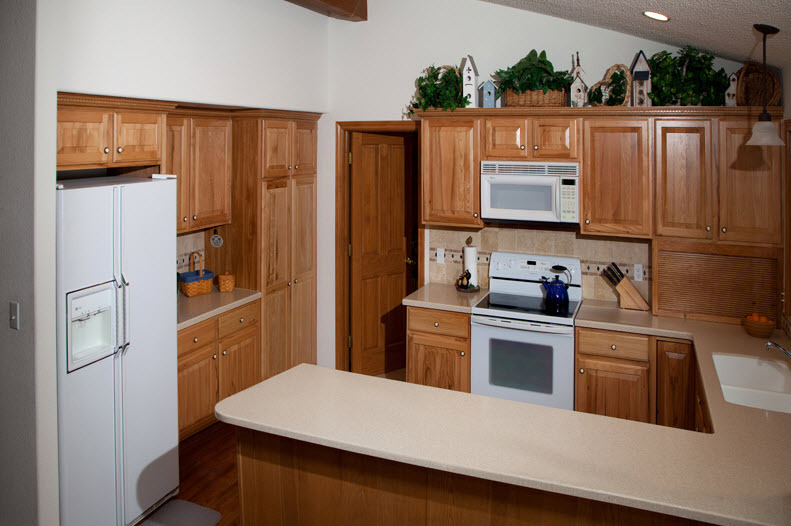 Bring a sketch of your kitchen cabinets along so they can calculate how many slabs you need to reserve. They will sell your granite slabs to your fabricator. Counters: Stainless Steel, Concrete, Soapstone, Marble, Solid Surface. Don’t think for a minute that your only countertop choices are laminate or granite. Each different material has pluses and minuses. Some of the stones scratch easily, as does Stainless Steel. Others are hard as a rock. Your research and asking questions of suppliers and fabricators will pay dividends here. Counter Template and Install. A word to the wise, you need someone very familiar with the project to attend the counter template and install. It is important to plan the counter overhangs, seam locations, finished vs unfinished edges, etc, while considering the fit of your appliances and plumbing fixtures. You’ll need to have the faucet on hand for the install so that they can drill holes for it. Double-check before they drill the holes that they are centered on the sink the way you want them. It is very frustrating when a faucet is off center on a sink, and there is often no way to fix it. Install a Backsplash. Backsplashes are one of the most affordable upgrades in a kitchen, and are a GREAT place to showcase a beautiful stone or tile. The cost is often low because a backsplash is a relatively small space, so this is one of the best “Bang for your Buck” upgrades in your home. CAUTION: We suggest you have a designer help you select tile and design your backsplash. If you simply go to a home store you’ll limit your possibilities. Most tile showrooms and selection centers offer free design assistance. Your backsplash can be fantastic, do it right and you’ll love your kitchen forever! Device plates in a backsplash. Electrical device plates in a backsplash can be faux painted to exactly match the color and grain of a natural stone or tile. This is not easy to do, but if done right it turns out great! Termination Trim. A metal “Schluter” trim along the edge of your tile at a backsplash or at a doorway gives a very professional finished look. Caulking. Use a quality caulking to seal along your counters, sinks, vinyl windows, and where dissimilar hard surface flooring meets. PLEASE take the time to seek out a good color match for your caulking. Home stores may have a selection, but you will find a LOT more at a larger tile suppliers, hardwood suppliers. Dishwasher Fit. New flooring can create an unexpected problem in a kitchen. The flooring must go under the dishwasher, you can’t just end the flooring in front of the dishwasher or you’ll never be able to get the dishwasher out if it needs repair or replacement. If the flooring is too thick it might raise the dishwasher so that it does not fit under the counter. The best solution is to avoid the problem and not add too much thickness to the floor. The countertops may need to be raised in some cases. Building Department Requirements. Be aware of building code requirements in your area that affect your kitchen. Cooktop and range hood vent ducts must be sized and installed per the manufacturer specifications. 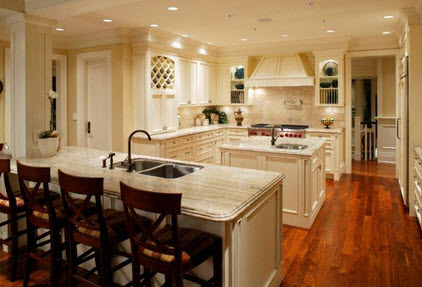 There are many specific electrical requirements for things such as dedicated circuits and multiple circuits that will affect your kitchen remodel. Fixtures and Appliances. You can have a lot of fun selecting your plumbing and electrical fixtures and appliances. Seek out stores that specialize in what you are looking for. Appliance stores for appliances, plumbing fixture showrooms for plumbing fixtures, and so on. You will enjoy their EXTREMELY knowledgeable staff, as compared to discount stores. And you will see a LOT more options for fixtures, finishes and appliances. Appliances Scratch Floors! Do EVERYTHING YOU CAN to protect your floor when moving appliances. Carrying straps allow you to have good control of even the heaviest appliances. Use a suitable surface protection material directly in front of the final location so that you can roll or slide the appliance if necessary. Fun Things to Add. 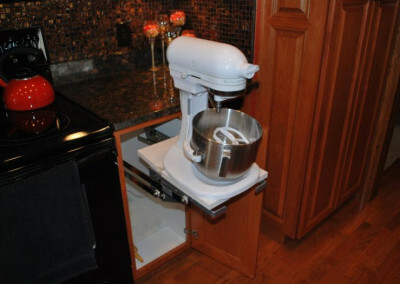 An air switch in the countertop for the garbage disposal, an appliance garage, roll out shelves, a heavy duty mixer lift, pull outs, swing outs and organizers will all add to the “wow factor” of your new kitchen. Kitchen Remodel Planner. There are a LOT of things to consider when renovating a kitchen. A kitchen remodeling and design consultant will be a valuable resource for kitchen renovation ideas, whether you are planning a Do It Yourself kitchen remodel or plan to use a kitchen remodeling service. Help schedule and set priorities by providing residential renovation project management skills.